I'm kicking off June with my choice for book of the month. Having spent a lot of this year reading crime and thriller books, this time I've leaned back towards a genre that's always been a favourite of mine, romance. I was lucky enough to receive a copy of Josie Silver's latest novel, One Day in December via Netgalley last month. And before I go ahead a review the story, I'll start by saying that I finished it in less than 4 hours! If you are a fan of authors such as Jojo Moyes and stories such as Ps I Love You then this is definitely a book that you will want to be reading. Laurie is pretty sure love at first sight doesn't exist. After all, life isn't a scene from the movies, is it? But then, through a misted-up bus window one snowy December day, she sees a man who she knows instantly is the one. Their eyes meet, there's a moment of pure magic...and then her bus drives away. I'm sure that you can decipher from the blurb that a sort of love triangle ensues but this definitely isn't your typical boy meets girl, boy cheats on girl kind of tale. The story is told from two points of view, Laurie's and Jack's (bus boy) and what follows is years of their lives as they both embark in separate journies and relationships whilst trying to keep their own friendship together. This is a book all about the feels! I'm lost. Lost in his words, and his arms, and in what might have been. As the years progress there is a sense of an emotional rollercoaster but what's refreshing is that Josie hasn't made it overly dramatic just to get a rise from the reader. It comes across as 'real' and the struggles that each character faces aren't just brushed over for the sake of a happily ever after. Whilst reading I was wondering to myself just how I would react if I had been placed in similar situations, would I remain calm, defiant or somewhere in-between? What this story presents us with is a lot of missed chances and an unconventional romance that quite honestly I challenge you not to well up at. Ok I know I'm known to cry when reading books but this novel was just so unexpected but so very 'British'. This is a tale of love, loss and friendship, of opportunities and find oneself whilst feeling so utterly lost. "I hold him, and he holds me, and for the first time in years, there's nothing missing at all." 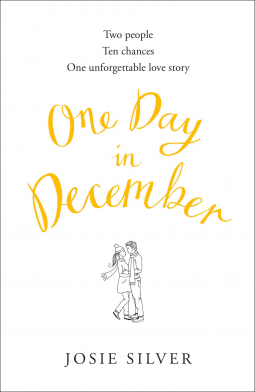 One Day in December is a captivating, swoon worthy story that is both beautifully heartbreaking and wonderfully up-lifting. After reading it I was left with a sense of peace and hope. All I can say is please read this novel! And on a side note a film version of the book wouldn't be such a bad thing either. I used to be a fan of romance, it was all I ever read but since moving to thrillers I've not really gone back.